The best Rolla Casino Bonus - We think it is about time to Rock n' Rolla! Roll on with this top-notch casino! Roll the dice at this cool new casino brand from 2018! Rolla Casino has a lot to offer and everything is beautifully packaged on a red and white website! The Casino Viking immediately found this as his kind of place of gaming. It was launched in the mid-summer of 2018 and while he tried it out, everything was not really set. However, he got us his review of this online casino and all-in-all he seems quite impressed. Read what he has to say and find out if the new casino Rolla might be something for you! Our Viking found the sign-up button straight away, in the middle of the start page. Once going through the two steps of sign up, he was ready to take on this website and all its features. First of, he liked the neat looking menu at the top of the page. This is where you will find the games page, tournaments and Rolla Riches. The two latter not live at the time of the Vikings review, sadly. However, the games themselves was something that he really liked. 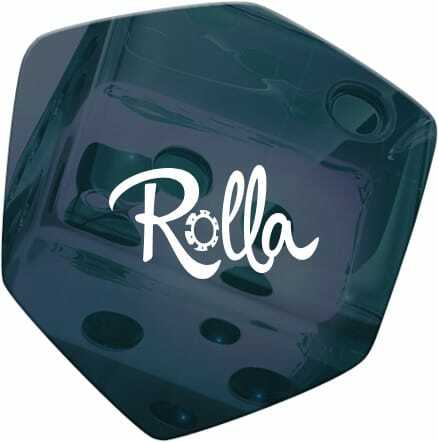 The developers behind Rolla online casino have lined up partnerships with different game producers. The variety of games was something that the Viking really appreciated. Yggdrasil, Play N Go, NetEnt, Quickspin, Pragmatic Play and many more are at your disposal if you decide to register for an account. Of course, there will be plenty of slot games. But also video poker, table games, roulette and blackjack. So basically something for everyone. You can easily search for a specific game title if you already know what you want to play. The Viking wanted to try out something new, so he decided to try out the different categories, which are quite good if you just know what kind of game you want to play. But not an exact one. One thing that he really liked was the loyalty program he found at Rolla Casino. By doing specific missions, he got the possibility to earn rewards. This is the way to get the most out of your gaming, according to him, and something that you shouldn’t miss out on. You get to personalize your own dashboard a bit as well. So everything can be found wherever you want it to be. A neat details that our Casino Viking thought was a fun feature. Many games, tournaments and a big loyalty club are also things that you might appreciate if you join Rolla Casino today. Do as the Viking, Rock n’ Rolla!